Portable North Pole (or PNP for short) is an online service which allows you to make personalised videos from Santa. There are 2 free video options available, or you can opt to buy a pass, which gives you access to more video templates, if you prefer. This year, the Magic Pass Package costs £9.99. For that, you can make as many videos as you want, and download them all in HD. So you get to keep the magic alive forever! (This is a big plus for me, as I wanted to put the videos onto the kids’ iPads so they can watch them even when we have no internet). 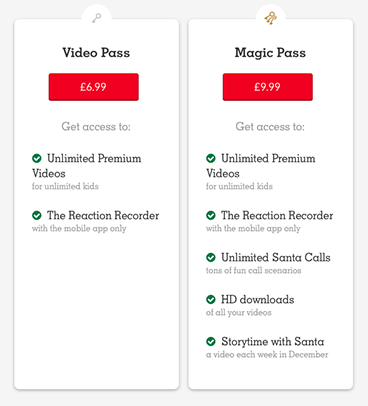 You can set up an unlimited amount of Santa calls, access to the Reaction Recorder service on the mobile app, and you can also create personalised story videos too. (A new story is released each week in December)! With the Magic Pass, you can choose from 8 different personalised Christmas videos, and there are over 16 personalisation options as well. You can also add upto 5 photos to each Premium video, which helps to make them even more magical. If you prefer, you can opt for the “Video Pass”, which doesn’t offer quite as much for your money in my opinion. This is our Fourth year of using Portable North Pole now. The first year, I made the free video as Sam was only a toddler, so didn’t know what was going on. For year two, I paid to make some videos for my own children, nieces and nephew, which went down really well. The past 2 years, I have been lucky enough to get a free subscription in order to review the service on my blog. I’d definitely have paid the £10 if I hadn’t though. The phone calls are another fun part of the PNP package – There’s nothing quite like seeing your 35 year old sister’s baffled expression when Father Christmas phones to warn her she needs to be nice to her siblings if she wants to stay on the nice list! Honestly: I think Portable North Pole really helps to get us in the Christmas spirit. The kids love the videos, and I love seeing their faces when they watch them. PNP has definitely become one of our Christmas Traditions. We received a free Magic Pass for the purpose of this review. All words and opinions are my own.